I came up with a pretty cheap and gallery style method of hanging my prints on Saturday. I purchased some metallic prints from Mpix last week and really wanted to hang all 6 of them. I went to my local Michael’s store as I usually do for frames. I just couldn’t pull the trigger on, at a minimum, $120.00 to hang 6 pieces, and that is not including tax! I did end up purchasing frames, one for the piece we bought at the pumpkin festival and another for a print I bought in Alaska 2 years ago…see how much I hate buying frames! 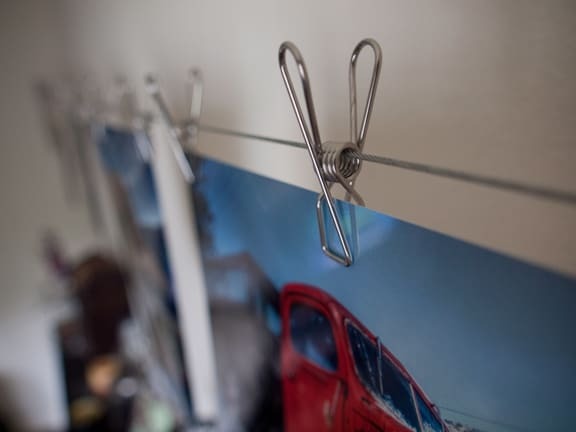 There had to be another way, I had thought of hanging them like the old college days with a metal push pin, but then there would forever be a push pin hole in the print. After some brain racking, I came up with a metal clothes line with clothes pins concept, inspired by the metallic nature of the prints. This is great for me, I get sick of looking at my own art very quickly. It is not uncommon for me to give it away once it is complete, especially my paintings, for some reason those look embarrassing after a while. Stainless Steel Clothes Pins from the Container Store: $.50 Ea. (20 Required) It took me a week to find these! 7 Prints hung for under 20 bucks…. That’s what I’m talkin’ about! Screw the eyelet into the wall. I highly recommend using a wall anchor if screwing into dry wall. Attach the bolt connector to the Eyelet. Loop your Wire through the first aluminum furrel. Clench it in place with pliers (i did it in 3 places with the cable cutting portion of needle nose pliers). Attach it to the connector link on the first wall. Slide the center portion of the clothes pins onto the opposite end of the wire. Route the furrel onto the galvanized wire. Do not clench it yet! Place your unclenched furreled loop into the opposite wall’s bolt link. Pull wire excess through the furrel until your line is taut. Clench the furrel in place and snip the excess cable with cable cutters. The circled portion is the clothes line. It is probably pretty obvious, however, I know how distracting my wife’s radiant glow can be! I always shoot 5 images now, it has become a habit. This is a 15 image panorama, the 3 sets of 5 images were processed in Photomatix and the 3 resulting images were photo merged in Photoshop. I also did a panorama of the 3 Key images to show you why HDR is always the best option. The amount of information picked up in the HDR version is much more dynamic, no pun intended. I don’t have a flash for my camera, and with HDR you don’t necessarily need one for indoor photography anymore.